Ever had your credit card stolen? Frustrating isn’t it? Well, Austin here was observed on video from the Marriott in Walton County using a stolen credit card for a room. Free vacation? Not so much. During the course of the investigation 70 credit card numbers and 10 different driver’s license copies were found in her possession without the permission of the respective persons and businesses. That’s what makes Austin Ivie Whitmire, 26, our latest Turn ’em in Tuesday contestant. Whitmire’s last known address is 8407 Thomas Drive in Panama City. She is known to frequent Atlanta and the surrounding suburbs. She currently has active warrants for dealing in the credit cards of another, use/possess ID of another person without consent, unlawful use of a credit card to obtain goods greater than $300, and defrauding an Innkeeper for more than $300. Christmas is coming. So, if you need cash and know where Whitmire is, give us a call. You could be eligible for a cash reward. Anyone with information regarding this case is encouraged to contact Walton County Sheriff’s Office at (850) 892-8111, or you can remain anonymous by calling Emerald Coast Crime Stoppers at (850) 863-TIPS. Submit a web tip at www.emeraldcoastcrimestoppers.com or send a mobile tip using the P3 Tips Mobile Application. 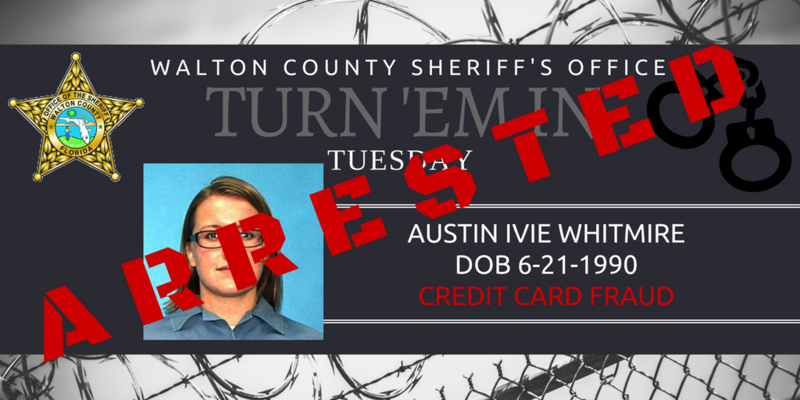 On December 1st Austin Ivie Whittier, 26, found herself in the hands of authorities over in Bay County and was arrested on multiple Walton County warrants.